Happy Sunday! Here we are again! Another week gone by, but this week we have a HOLIDAY! 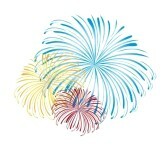 "Happy 4th of July 2012!" If you click on the words, it will take you to the paperback copy - they don't have the image available for it so if you click on the image, it will take you to the Kindle version. EBOOK: *FREE - *free means the first so many chapters, usually 22 are free. After that you have to purchase the rest of the ebook which generally retails for $12.99. Don't let this ZERO price fool you. EBOOK $1.99 - This book is ONLY available as an ebook. A paperback of this book does NOT exist. And there we have them all! The Top 15 Best Sellers! Hope you have found some NEW books YOU want to read!